The days after parents hear their child has a disability or special need can be difficult days. Most parents go through a mourning process. The expectations and dreams they may have had for their child die and new ones must take root. Some are in a whirlwind of doctor’s appointments. Some feel like they are learning a new language of acronyms and medical terms. All of them need an anchor to help steady them. Be there. In Job 2:11-13, Job’s three friends traveled to see him after they heard what happened. Scripture says for seven days and nights they just sat with him on the ground. You don’t have to pack an overnight bag and camp out on your friend’s couch, but be there. And when you aren’t there, let your friend know you’re available if she needs you. Say something, even if you’re afraid it’s the wrong thing. After our son’s diagnosis, we were raw, and words that wouldn’t normally hurt sometimes did. But as we healed, we were less sensitive and much more appreciative of when friends didn’t ignore our situation, but joined us in the journey. When friends said nothing at all, we assumed their comfort was more important than our pain, and they weren’t willing to risk embarrassment. Offer help but don’t pressure them to accept it. You may be great at Internet research and do a few searches that provide what you think is lots of helpful information about therapies, specialists, or even vitamins. It would be great if you sent an email with links to what you found, so your friend could check them out when she’s ready. Keep including them and their children as much as possible. Special-needs parents are afraid they will lose all their friends because they are different now. Keep inviting them and their kids when you can and help them feel as comfortable as possible. We used to follow James around at parties and apologize for every little thing he did (like steal cookies of someone’s plate). But because our friends kept inviting us over, we grew more comfortable and were less stressed each time. And our friends learned to guard their cookies. But understand when they just can’t come. It can be physical, emotional, social, or even sensory issues that keep special-needs families from being able to do what typical families can do. Parents have to learn their kids’ limits and sometimes those limits won’t allow them to hang out like they used to. They still want to be invited, but they don’t want to feel guilty when they have to say no. Stand in the gap for them, especially with your typical kids. We were meeting a friend of mine at the mall and our kids were going to meet each other for the first time. She emailed me ahead of time and said her kids hadn’t been around many kids with autism, and she wanted to make sure they were polite but not pushy. She asked me how they could make James comfortable and not overwhelm him. I answered her questions and then she was able to communicate with her kids what to do. It made the meeting easier on all of us! Special-needs families usually don’t mind answering questions, but if you can anticipate the questions your kids will have and answer them ahead of time, it makes it easier on us (and especially easier on our typical children, who can feel embarrassed by too many questions about their siblings’ special needs). Do your own research. In the first days after James’s diagnosis, our parents asked a lot of questions. Some of the questions they asked we couldn’t answer. Then we felt bad we didn’t have all the answers yet. Grandparents and siblings can do research too. Find out how your lives are going to change and how you may be able to help. Don’t pretend like nothing is happening. Denial can be part of the healing process, but move through it as quickly as possible. If you aren’t willing to hear about the hard parts, you won’t be able to fully appreciate the accomplishments (no matter how small they may be for others). Try not to come across as judgmental or condescending. We’ve heard lots of fellow special-needs parents say their parents say things to them like, “Well, if you’d just put your foot down and not allow that behavior” or “All she needs is more discipline.” Trust that they are doing the best they know how to do in a tough situation. Pray for them more than your push them. Help as you are able. Babysit, bring over food, do the laundry, and/or send a little money in the mail to help cover therapy costs that week. Some grandparents and aunts and uncles do a lot, and some do less, but all can do something, and it all helps. If you are a pastor visiting a couple who just had a baby and found out the baby has a special-need, first rejoice with them for the life of the child God has given them. Assure them you and the church will love and accept their child every day of that child’s life. Don’t offer cliche phrases that can sometimes do more harm that good, like “God won’t give you more than you can handle” or “God only gives special kids to special parents.” Instead, rely on the truth and power of Scripture. It has the power to heal and restore. Pray for the family and pray over them. After our son’s diagnosis, only one person prayed out loud over me, and she was a visitor to the Sunday school class I taught. Many said they were praying for us, which was helpful, but it was even more moving to hear words spoken to our Father on our behalf. Make plans to accommodate for their child to the best of the church’s ability. Pray for the resources to do so. 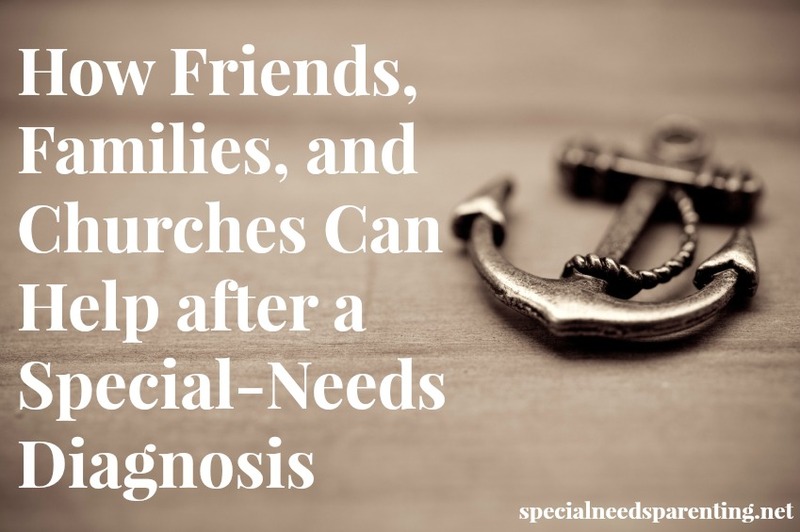 A high percentage (some people report as high as 90%) of families with children with special needs don’t attend church. Our church considers them an unreached people group. We are active and intentional about reaching them with the love of Christ, and we believe every church should be as well. Having a child with special needs changes everything. Relationships that used to be easy take extra work, for the family directly impacted by the diagnosis and for the friends, families, and churches supporting that family. But it’s worth it, for everyone. If you are a special-needs parent, what other advice do you have for those who want to help? Next PostNext Nominate a Special-Needs Parent for Us to Feature!